In July of 1972, US bombers were working to crush Quong Tri from above as the South Vietnamese embarked on what was to become a failed two-month effort to wrest control of the northern Binh Dinh province. Plus, Jane Fonda was in country. Barbarella wore fatigues and boonie hats. She straddled Charlie’s anti-aircraft guns–the same kind that fired shots at those planes over Quong Tri. The Oscar-winner from Klute went from being Henry’s girl to being Hanoi Jane. She even took to the airwaves, with NVA assistance, to decry America’s military activity. That happened about a week after the release of a Francine Parker documentary, FTA. FTA is an acronym with at least four potential meanings. It was “f*ck the army”, “free the army” and “Free Theater Association”. It could also mean “freedom, travel and adventure” (perks touted by army recruiters at the time). The documentary tracks a travelling anti-war road show featuring Jane Fonda and her Klute co-star, Donald Sutherland. 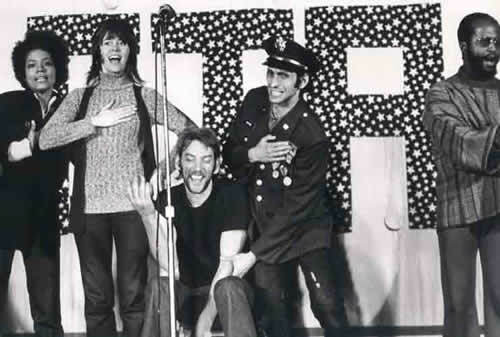 This folk-singing, joke-telling collection of performers put on a series of shows near military installations and attracted a large number of soldiers–including many who were openly expressing their discontent with the war. American Independent Pictures distributed FTA. It had been in theaters for a week when Fonda’s controversial date with Charlie began to claim headlines. AIP summarily pulled FTA from the theaters in the wake of the Fonda controversy. Some people say that AIP just didn’t want the hassles that would come by being associated with Fonda. Others claim that threats from increasingly unpopular White House were behind the decision. Regardless of the reason, FTA disappeared from theaters. They didn’t just lock the prints away. Someone had them destroyed. FTA vanished. The only people to see the movie for years were those with bootleg copies. Eventually, a complete print showed up somewhere, allowing for a 2009 DVD release. Today, we’re stuck in another seemingly endless land war in Asia. Circumstances are radically different but just like then, there’s a large component of the population who’d like to see the combat end. This time, though, Hollywood isn’t talking about it the way they did forty years ago. Sure, you’ll hear occasional comments from the best-known left-leaning creatives from time to time, but no one is bringing an anti-war vaudeville show to the towns near military bases. After watching this documentary, I’m not sure that we’re missing much. FTA consists of two different elements. The movie is a fifty-fifty split between interviews of US soldiers who felt a strong distaste for US activity in Vietnam and the group’s campy stage show. The interviews are interesting. It’s amazing to see enlisted Marines decry violence in the name of imperialism and to express their doubts and disappointment. None of them says anything earth-shattering, but hearing from them provides the viewer with a clear glimpse of the period and the concerns of those who were charged with the responsibility to carry out an ultimately failed plan of attacks. The unhappy soldiers and Marines aren’t necessarily spot-on in terms of their analysis, but they got the basics right about Vietnam. They saw the writing on the wall long before the last chopper pulled away from the embassy. The other half of the movie, the part that documents the actual FTA touring show, is almost unwatchable. Fonda and Company wanted to create a counterpoint to the Bob Hope USO shows of the day. Instead, they did something that looks, sounds and feels a lot like something put together by a bad junior college theater class with a vaguely politically aware high school student serving as head writer. The folksy songs are catchy, but in an irritating way. The jokes and jibes are delivered earnestly, but they’re dull and obvious. The skits won’t make you smile. The hearts are in the right place. Whether you agree of disagree with the sentiments of FTA, you can tell that those involved felt like they were doing the right thing. They believed. They just didn’t have a very good show. Sutherland is the sole exception. If anyone comes out of FTA looking good, it’s Sutherland. He has one inspired bit as a sportscaster announcing a firefight between US and NVA forces. He also brings some pathos to the affair with a reading from “Johnny Got His Gun”. There’s a chance that earlier FTA shows may have been better than those from the Pacific Rim show featured in the movie. An interview with Fonda included on the DVD release reveals that the group originally featured Peter Boyle and Howard Hesseman. They parted ways when Fonda decided to tackle the issue of the group’s racial composition, responding to a black/white cast imbalance. She says the cast changes helped FTA to connect with the black GIs. That may be true, but it’s too bad Hesseman and Boyle couldn’t still be a part of the act. In terms of moviemaking, FTA is a very straightforward documentary. There’s no omniscient narration and no one really speaks over the footage. There are a few smart shots and the camera finds occasional artifacts that do a good job of underlining key points. Parker’s primary gift to viewers is a snapshot of a time that’s quite different than today. I can’t imagine Sean Penn and Will.I.Am embarking on a tour outside of US military installations today. I can’t visualize them sitting down for rap sessions with soldiers or coming right out and making unmistakably strong statements about the Army and its policies. Today, the Dixie Chicks can lose half of a career by expressing disappointment in a President. Jane Fonda will always be Hanoi Jane to a large percentage of the population. Getting as loud and as straightforward as the FTA team is bad career mojo. The DVD’s interview with Fonda circa 2009 is a must-watch. In it, she admits to a political immaturity in the early 70s and there are moments when you can tell that the beliefs of “the movement” that fueled FTA still move her.